Nalanda College Astronomical Society is the leading School Astronomical Society in the Island through its history of 23 years. From 1995, it has done an immense service to the school students and to the public too. Astronomy is not an unfamiliar subject to the students all over the world but it’s little bit unfamiliar for Sri Lankan students. 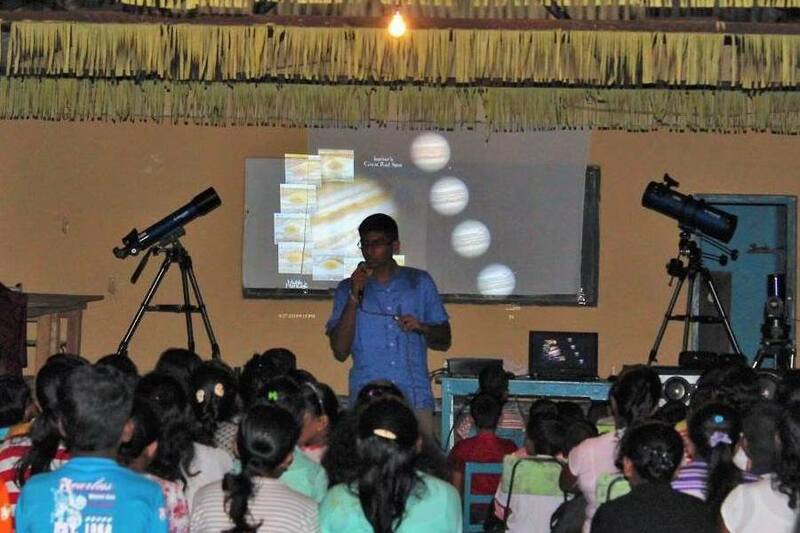 As this is the situation prevailing, the Nalanda College Astronomical Society is taking the responsibility of educating the school children all over the island about Astronomy. We are the pioneers in conducting night observation camps in Sri Lanka. Throughout a year we hold several night camps, both at school, public places and especially in our fellow brother and sister schools. What is the use of the knowledge that is collected and stored, which is not shared? we always sharre our knowladge with the team members, other schools as well as the public. 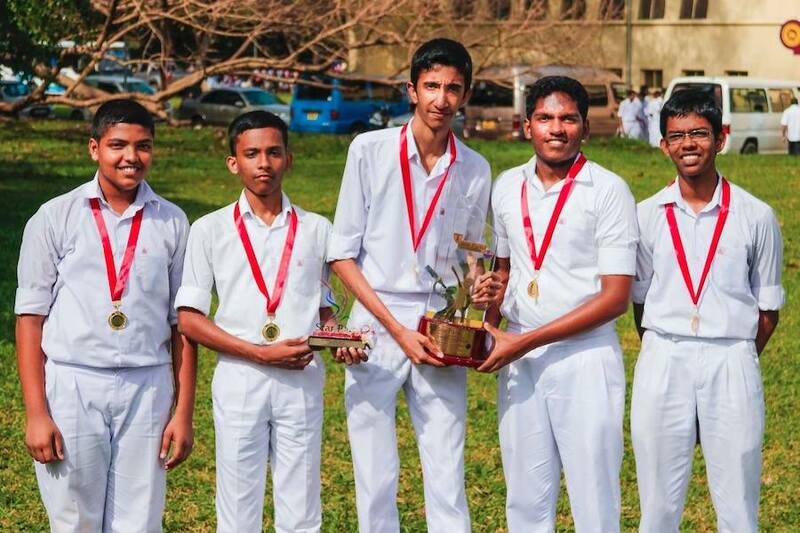 Our Quiz Team emerged Champions and Runners up at many all Island Inter School Quiz competitions. We won a bronze medal in International Olympiad on Astronomy and Astrophysics (IOAA) also. "Taking Astronomy to Sri Lankan Village"
The IAU-100 special project Dumbara Sky event will be held on 10-11 February 2019 in Ududumbara and Kaikawala, Sri Lanka to popularize astronomy (and STEM fields in general) among the students in rural areas. Done as a joint effort by NCAS, NCAAS and Astrominds, the event aims to bring the science awareness and the interest to pursue STEM fields of the school students by holding a series of star parties and astronomy outreach events in a few of the most remote villages in Sri Lanka that are located in the outskirts of Dumbara (aka Knuckles) mountain range. There will be a night sky observation camp and a solar observation session during the event. මොකද්ද මේ Super Blue Blood Moon ? Here we talk with a scientist at the Institute of Optics, University of Rochester about basics and applications of adaptive optics. Here we talk with a Ph.D. student at the Flaum Eye Institute, University of Rochester about applications of adaptive optics in biology, specifically in retinal imaging. දෙවන සඳ එහෙමත් නැත්නම් Blue Moon කියලා අදහස්කරන්නෙ නිල් පැහැ සඳක්නම් නොවේ. සෑම වසර දෙකහමාරකටම වරක් එකම මසක් තුල දෙවරක් පුරහඳ දිස්වීමේ සංසිද්ධියයි. මේ මාසයේ දිස්වන දෙවන සඳ සුවිශේෂි වෙන්නෙ එදිනටම පූර්ණ චන්ද්‍රග්‍රහණයක් යෙදී තීබීමයි. පූර්ණ චන්ද්‍රග්‍රහණයක් අවස්ථාවකදී දිස්වන සඳ ගඩොල් රතු පැහැයක් ගන්නවා සමහරවිට ඔබ නිරීක්ෂණය කර ඇති. ඊට හේතුව පෘථිවියේ වායුගෝලය හරහා සඳ දෙසට යන සූර්ය වර්ණාවලියේ දෘශ්‍ය පරාසයේ නිල් පැහැය දෙසට වන්නට ඇති ආලෝකය වායුගෝලය තුල විසිර යාම හෙවත් ප්‍රකිරණයත් (scattering), වර්ණාවලියේ රතු තැඹිලි පැහැය දෙසට වන්නට පිහිටි ආලෝකය පමණක් සඳ දෙසට ගමන් කිරීමත්‍ නිසායි. මෙලෙස දිස් වන රතු පැහැ චන්ද්‍රයා රුහිරු සඳ (Blood Moon) ලෙස හඳුන්වයි. Today we are here to discuss with Prof. Chandra Embuldeniya about the importance of astronomy in promoting STEM (Science, Technology, Engineering and Mathematics) related fields in Sri Lanka. Prof. Embuldeniya is an alumnus of Nalanda College and he was the founding president of the Nalanda College Astronomy Club (1963/64), which was functioning in the early 1960's. He was the founding vice chancellor of the Uva Wellassa University in Sri Lanka and is a former president of the Sri Lanka Chamber of Commerce. මේ 2017 අගෝස්තු මාසයේ 21 දින ඇමෙරිකාවට දිස්වුණ පූර්ණ සූර්යයග්‍රහණය නිරීක්ෂණය කරමින් ආදි නාලන්දීය තාරකා විද්‍යා සංගමයේ අශාන් ආරියවංශ ගෙන එන විශේෂ වීඩියෝවේ පළමු කොටසයි. ඇමෙරිකාවේ ටෙනසි ප්‍රාන්තයේ නොක්ස්විල් නගරය ආසන්නයේ සිට විඩියෝ ගත කෙරුණ මේ විශේෂ අවස්ථාවේදී පරිසරයේ සිදුවන වෙනස්කම් සහ සූර්යයාගේ දක්නට ලැබෙන විශේෂ අංග (features) බලාගන්න පුළුවන්. විශේෂයෙන් ම හිරුගේ ආලෝකය අඩු වීම නිසා රැහැයියන්ගේ හඬ අපිට අහන්න ලැබෙනවා. ඒ වගේම තමයි හඳෙන් ඉර වැහෙනකොට ගස් වල අතු අතරින් එන ඉර එළියෙන් ඇතිවෙන හෙවණැලි, අර්ධව වැහුණු ඉරේ හැඩයට බලාගන්නත් පුළුවන්. මේ සිද්ධිය සිදුරු කැමරාවේ මූලධර්මය පාවිච්චි කරල පැහැදිලි කරන්න පුලුවන්. ඉර සම්පූර්ණයෙන් වැහුනට පස්සේ ක්ෂිතිජය වටේටම ඉර බහිනවා වගේ වර්ණයකුත් බලාගන්න පුළුවන්. එත් එක්කම බෙලිගේ පබළු සහ දියමන්ති මුදු ආචරණය (Bailey's beads and the diamond ring effect) පැහැදිලිව දකින්නත් පුළුවන්. ඉර සම්පූර්ණයෙන් වැහුනට පස්සේ ඉරේ වායුගෝලයේ කොටස් විදිහට තියන රෝස පැහැයෙන් ඇති වර්ණගෝලය (chromosphere) සහ දීප්තිමත් සුදු පැහැයෙන් ඇති කොරෝනාව (corona) නිරීක්ෂණය කරන්නත් පුළුවන්. වර්ණගෝලයේ පිටතට විහිදිලා තියන නෙරුම් වන solar prominences කිහිපයකුත් හොදින් පේනවා. මේ දේවල් ගැන වැඩි විස්තර ඊලග විඩියෝ එකෙන් ගෙන්න අපි බලාපොරොත්තු වෙනවා. 2017 අගෝස්තු මස 21 දින ඇමෙරිකාවට දිස් වුන පූර්ණ සූර්යයග්‍රහණය ගැන අපි කරපු වීඩියෝ එකට පසු විපරමක් තමයි අපි මේ වීඩියෝ එකෙන් කරන්නෙ. ඒ අවස්ථාවේදී අපි දැක්ක දේවල් මොනවද කියන එක ගැන සහ ඒ දේවල් එහෙම පේන්න හේතු මොනවද කියන එක අපි මේ වීඩියෝ එකෙන් කතා කරනවා. විශේෂයෙන්ම සූර්යයග්‍රහණයේ පූර්ණ අවස්ථාවේ අපි හිතපු තරම් පරිසරය අඳුරු වුනේ නැත්තේ ඇයි, මේ අවස්ථාවේ සූර්යයාගේ දාරය රෝස පැහැයෙන් දිස් වුනේ ඇයි, සූර්යයාගෙන් පිටතට තිබුණ නෙරුම් මොනවද.. වගේ කරුණු ගණනාවක් අපි පැහැදිළි කරනවා. 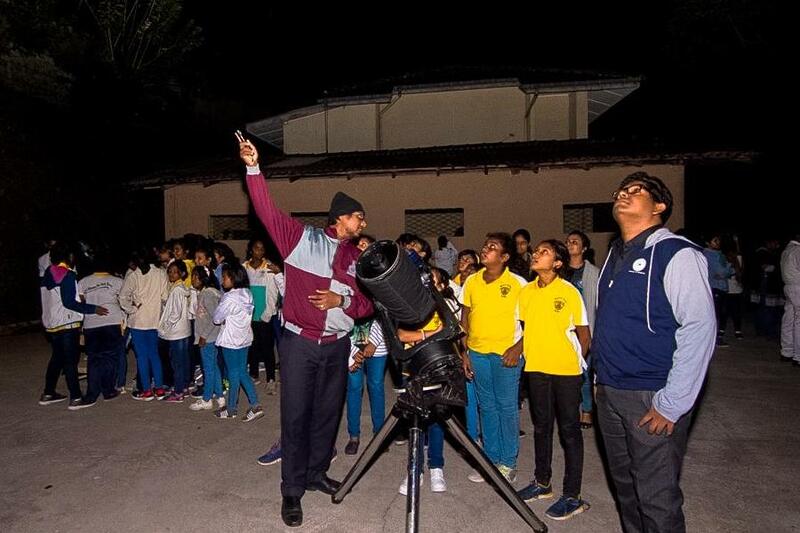 The IAU-100 special project Dumbara Sky event will be held on 10-11 February 2019 in Ududumbara and Kaikawala, Sri Lanka to popularize astronomy among the students in rural areas. We started our 1st #100HoursOfAstronomy event just now. The Solar Observation Camp @NalandaCollege , Colombo, Sri Lanka. This includes solar observations with H-α personal solar telescope for 300 students who are in grade 5 to 13.
ncastronomy © 2019. All Rights Reserved.